Campbell, CA – September 7, 2017 – It has been a historic week for PetCure Oncology, a national provider of cancer care for pets that treated it’s 1,000th patient on Tuesday. 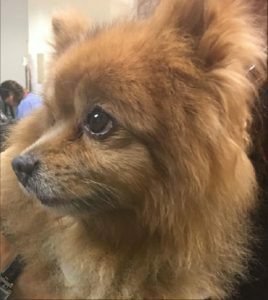 Meet Peanut, the first Bay Area pet treated by PetCure Oncology at SAGE. The milestones continued on Wednesday, when the company’s newest site – PetCure Oncology at SAGE in the Bay Area – became the first veterinary medical provider in the world to treat a pet for cancer with the brand new Halcyon™ treatment system. Halcyon is the newest cancer treatment device engineered by Varian Medical Systems, the world’s leading manufacturer of medical devices and software for treating and managing cancer. The advanced treatment system was recently completed following a five-year engineering process designed to simplify and enhance virtually every aspect of image-guided, intensity-modulated radiation therapy. Halcyon offers increased speed, more efficient workflow, and sharper precision than previous machines, benefitting both clinicians and patients with an advanced delivery mechanism for radiation therapy. In July, PetCure Oncology and Varian Medical Systems announced a strategic collaboration intended to improve cancer care for pets and support PetCure’s goal of building a stronger bridge between human and veterinary cancer care. Among other things, the collaboration includes the deployment of six Halcyon units at current or future PetCure Oncology centers. 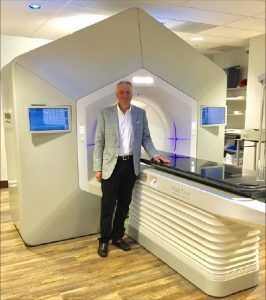 The first Halcyon was installed last month at PetCure Oncology at SAGE in Campbell, California, part of a four-center veterinary specialty network operated by SAGE Centers for Veterinary Specialty and Emergency Care. The Campbell location, just south of San Jose, is the seventh center in PetCure’s rapidly-growing national network. It officially opened last week and delivered its first radiation therapy treatment on Wednesday. PetCure Oncology CEO Scott Milligan stands next to the first Halcyon unit in veterinary medicine. The three leaders in their respective markets are committed to working together for the betterment of pets, pet families, and veterinarians in northern California. The PetCure Oncology at SAGE partnership provides comprehensive cancer care, including access to stereotactic radiosurgery (SRS) provided by an industry-leading team of veterinary radiation oncologists. With the addition of Varian’s Halcyon and supporting software platforms, treatments will be delivered with a level of precision and efficiency on par with the most progressive human oncology providers in the world.